Tagged under Bakemonogatari, Vampires, Long Hair, Blonde Hair, Waifu. Shinobu is a girl who lives with Meme in the abandoned building. She appears to be an eight year old girl, but she was originally a beautiful vampire who had lived for more than 500 years. 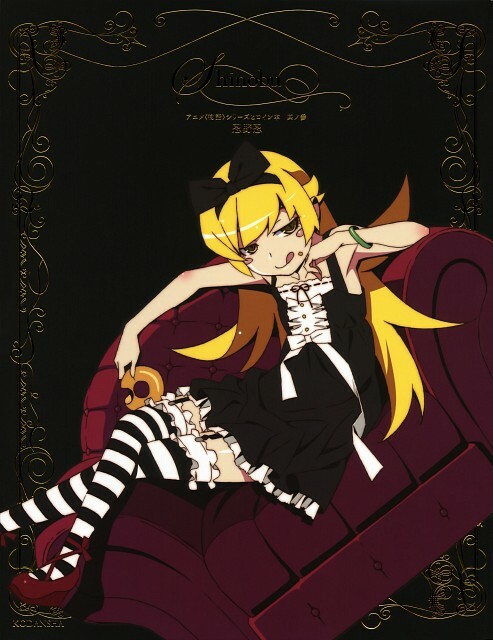 After the events at the end of Koyomi Vamp, she was left in a weakened condition with no powers or traces of her original personality and therefore had to abandon her "Kiss-shot Acerola-orion Heart-under-blade" name. She was named Shinobu by Meme at the beginning of Hitagi Crab, suggesting her kanji name Shinobu, having "heart" under "blade", matches with her original personality.